For years we have been awaiting Dan Brown’s next novel and now the wait is finally over. 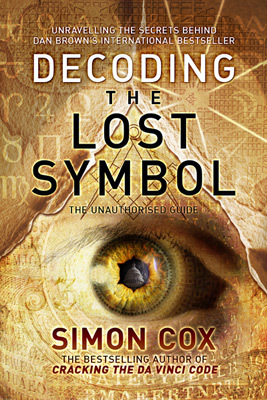 Hot on the heels of The Lost Symbol is Decoding The Lost Symbol, a book that Simon Cox has released as the ultimate guide to the new fictional episode in the life of Robert Langdon, Brown’s protagonist. I became involved with this project years ago and I mocked up covers for Simon’s book as early as August 2005. Dan Brown’s project was known then as The Solomon Key, and we were working towards releasing a title called Unlocking The Solomon Key. Then we heard that there had been a title change and we had to start again. Now that this book is finally out, I’m very happy with the final cover that I designed. I also worked on the interior plate section and on top of that I provided research for Simon’s book as well as handling some of the writing itself, as it had to be written in record-breaking time. It is great to see the book on sale in UK bookshops (US to follow in early November) just a month after the release of Dan Brown’s own title, and after putting in so much work on this project over the years it is satisfying to finally hold the results in my hands.